About 85% of the 3.5 million acres of turfgrass in Texas is irrigated at a cost of about 700 million dollars per year. Irrigation audits recently conducted by Texas A&M University staff on irrigated turfgrass sites show significant waste of water. By changing irrigation practices and adjusting other turf maintenance practices much of this water could be saved. In fact, if we could convince the public that straw-colored turf during mid-summer was acceptable on many sites, we could maintain turfgrass without irrigation. By planting adapted turfgrasses and adjusting turf maintenance programs, acceptable turfgrass can be provided on some sites without irrigation. For example, bermudagrass can be maintained in Central and East Texas on all sites without irrigation. Under this condition bermudagrass would provide a complete cover, could be maintained weed-free and would provide a playable surface for sports fields, playgrounds and golf course fairways. However, such sites would be dormant and straw-colored in mid-summer, but would recover following significant rainfall. Refer to the temperature and rainfall distribution maps for reference. I am not suggesting that we discontinue irrigating turfgrasses. Where water is available without limiting essential needs of people for water, the turfgrass industry should compete on an equal basis with other industries for water. Water, properly applied to lawns, golf courses and sports fields is not wasted. Benefits of green grass to people and to the environment are enormous. . .cooler temperatures in summer, cleaner air and water, better mental attitudes, food and habitat for birds and wildlife; all of which lead to healthier and happier people. On the other hand, I am suggesting that we discontinue wasting water by poor management. Too many people still think that all you need to grow grass is lots of water. I see that philosophy carried out on lawns, golf courses and sports fields all across the country. That concept contributes to the waste of billions of gallons of water in Texas each day during summer months. I am also suggesting that we stop using the absence of irrigation as an excuse for poor turfgrass. We can maintain a complete turfgrass cover anywhere in the state that receives at least 15 inches of rainfall, or about 95 percent of Texas. 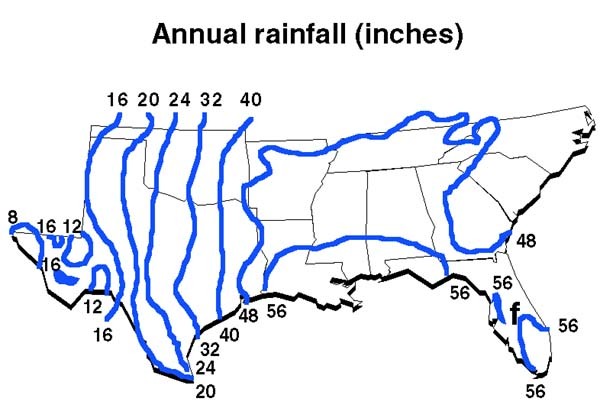 That requires using buffalograss and, perhaps, other native grasses in the 15 to 25 inch rainfall area; bermudagrass and zoysia in the 25 to 35 inch rainfall area and St. Augustine and centipedegrass only in areas with greater than 35 inches of rainfall. Growing turfgrasses without irrigation also requires a skilled turfgrass manager. Timely fertilizer and herbicide applications, proper mowing and cultivation, accurate and early diagnosis of insect and disease problems and traffic control are all required to maintain a turfgrass cover without irrigation. Mowing practices are critical on non-irrigated turfgrass sites. In general, mow at the greatest height within the limits of the use of the site (Table 2). For example, a bermudagrass lawn in Central Texas might be mowed at a 2-inch height; a bermudagrass sports field at 1½ inches and a bermudagrass fairway at 1 inch. These same sites should be mowed slightly lower in the spring and early summer. Mowing frequency should be such that only _ of the leaf is removed with each mowing. At a 1-inch mowing height, mow when the grass reaches 1½ inches tall. During spring and early summer this may require mowing at 3-day intervals. During mid-summer mowing may not be required for several weeks, depending on moisture conditions. By following the "rule of thumb" that you remove no more than _ of the leaf by mowing as suggested in Table 3, you find that as you increase mowing height you also increase the interval between mowing. During spring and early summer when the grass is actively growing, it is essential to follow these mowing practices to develop and maintain the density of turfgrass necessary to keep a turf cover and to compete with weeds. Failure to mow properly will result in thin, weedy lawns and playing fields. Table 2. Suggested mowing heights (in inches) for non-irrigated turfgrass sites. Roadsides, parks, golf roughs, etc. Table 3. Suggested mowing practices for all turfgrass areas. Precision fertilization based on soil test results, turf use, turfgrass variety and mowing practices is also critical on non-irrigated turfgrass sites. Inadequate or excessive fertilization produces weak, weedy turfgrass on non-irrigated sites. With irrigation you can increase mowing frequency to maintain turf density on over-fertilized sites. However, without irrigation excessive fertilization will burn (desiccate) grasses and increase weed growth. Fertilizer applications must be timed so that rainfall will activate the fertilizer and produce the desired response. For all turfgrasses, fall applications (six weeks before first expected frost) are most critical. Fall applications help the grasses recover from summer drought and accumulate energy reserves to survive winter dormancy. For bermudagrass, late spring fertilization will promote recovery from winter and help the grass compete with weeds. 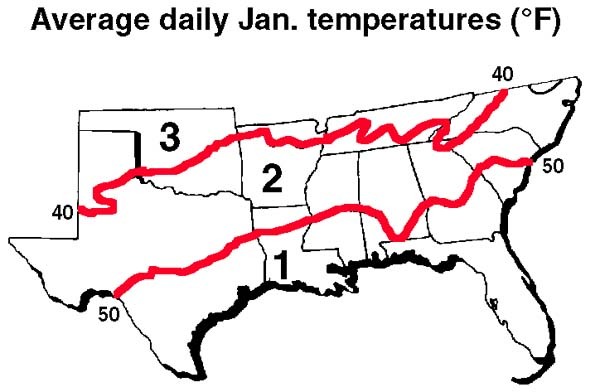 A slow release source of nitrogen should be used for the spring application to prevent "burning" in the absence of rainfall and to provide residual nitrogen into early summer. On bermudagrass turf, as much as two pounds of nitrogen per 1,000 sq. ft. can be applied in spring with a slow release source of nitrogen. Only 1 pound of a soluble nitrogen source should be applied in spring or fall. Without irrigation avoid summer application of nitrogen. Such applications of nitrogen increase the risk of "burning" and increase the demand for water. On golf courses and sports fields where nitrogen is needed for grass recovery, a two pound application of slow release nitrogen in mid-April will sustain growth through July if rainfall is adequate. POUNDS OF NITROGEN PER 1,000 SQ. FT. Effective weed control is another critical requirement for non-irrigated turfgrass sites. In the absence of an effective weed control program, winter annual weeds compete with turfgrasses and shade grasses during the spring when they are beginning to recover from winter dormancy. As a result, turfgrasses are thin in late spring and summer weeds become more numerous. Where winter weeds are prevented by preemerge herbicides applied in late summer or with postemerge products in late fall and winter, turfgrasses recover quickly in the spring and compete more effectively with summer weeds. Preemerge herbicides can be applied in late summer to all turfgrasses. On non-irrigated sites preemerge products will not be activated until significant rainfall occurs, but neither will weeds germinate before that time. Postemerge herbicides can also be used during late fall and winter. In bermudagrass, Roundup can be used during the dormant period for effective winter weed control. Thus, the turf manager has several options to effectively control winter weeds. Summer annual weeds are also troublesome in non-irrigated turfgrass. Fortunately, we have several postemerge products that effectively control crabgrass and other summer weeds. Avoid preemerge products in the spring that may delay turfgrass recovery or reduce rooting depth in turfgrasses. Such preemerge products reduce the drought tolerance of turfgrasses and may significantly reduce the density of turfgrasses going into summer months.